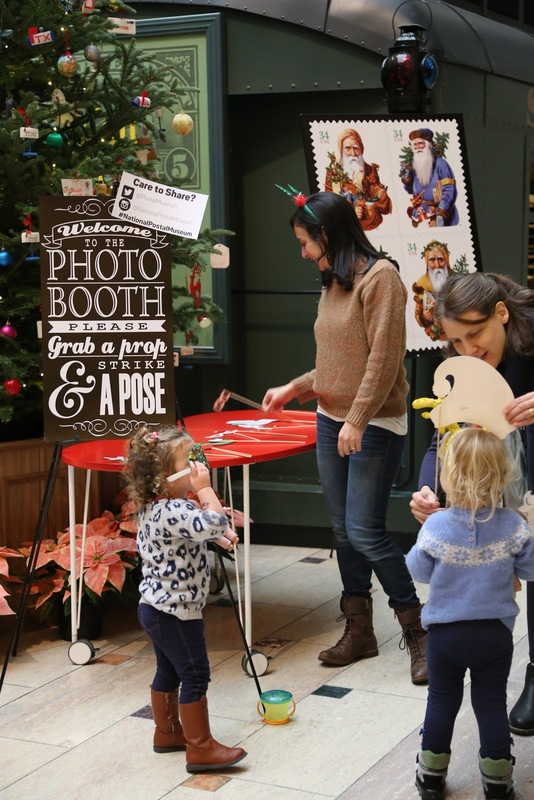 The National Postal Museum was bustling with visitors Saturday as the museum held its annual holiday card workshop. Visitors of all ages attended the event, at which they could design their own holiday greeting cards. As visitors entered the museum atrium, they started by choosing two pieces of card-stock, one large and one small. They then moved to embellish their cards with stickers, twine, and other materials available at the various craft stations. 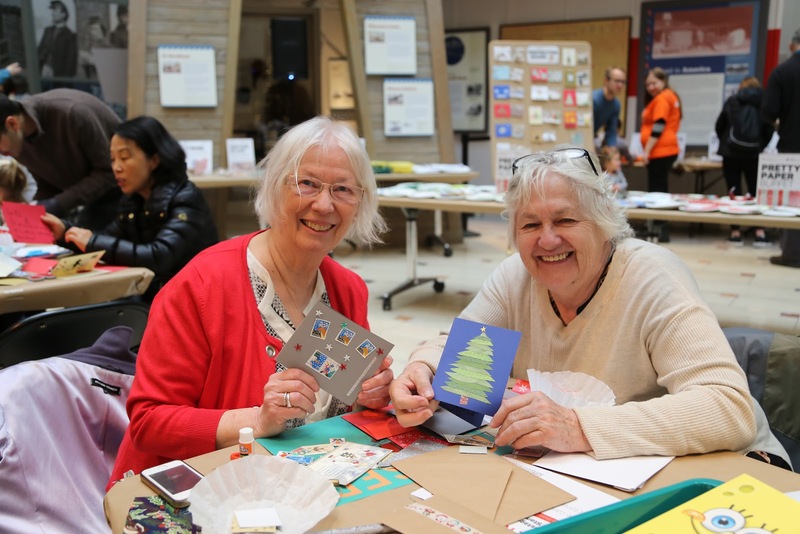 Visitors could sit at the tables in the atrium to assemble their cards with glue, scissors and other materials. The museum’s Post Office was open for visitors to mail their cards affixed with the museum’s special postmark. The museum also provided a photo booth for visitors to share their photos on social media using the hashtag #nationalpostalmuseum. In addition to the card making, visitors had the opportunity to write holiday messages to families at The Children’s Inn, an organization that provides housing and support for families with children receiving care at the National Institutes of Health. 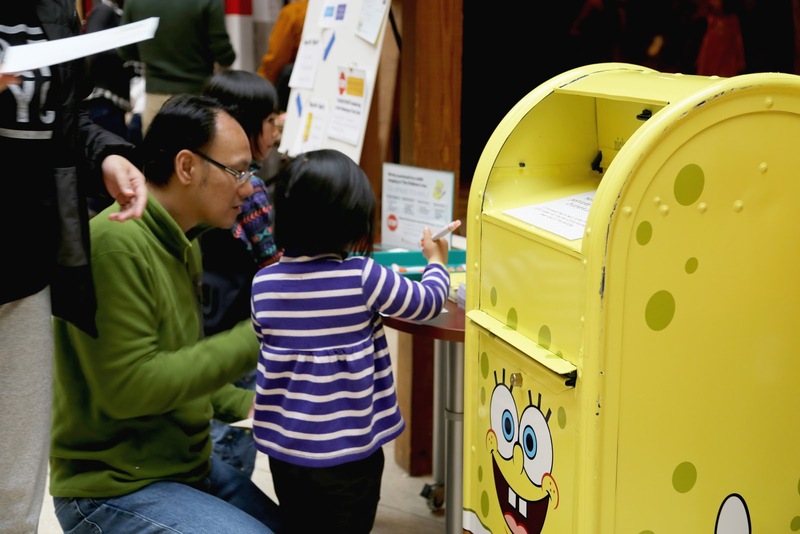 Visitors wrote messages on Spongebob-themed postcards and deposited them in a special Spongebob-themed mailbox. Director of Education Matthew White said he saw both parents children deposit postcards. The Postal Museum holds several public events throughout the year, including another card workshop around Valentine’s Day. Volunteer Coordinator Maggie Sigle said the museum also does letter writing campaigns around Veterans Day for Operation Gratitude, an organization that sends care packages and letters to U.S. troops and first responders. Hioki, who organizes the museum’s public events, detailed their Wine and Design program, available as a once-a-month happy hour event. At these programs, people can come to the museum after hours and complete various postal-related arts and crafts. The events typically occur once a month. The Postal Museum continues to provide educational activities for the general public to learn more about stamps, postal history, and the stamp collecting hobby. It is open seven days a week, from 10:00 am to 5:30 pm. This entry was posted in Uncategorized and tagged National postal musuem, smithsonian. Bookmark the permalink.